Here is full access to my article “Outlining a Biblical Theology of Islam: Practical Implications for Disciple Makers and Church Planting,” that first appeared in EMQ in January 2019. Taking into consideration the ambiguous nature of religion, a reconsideration of the historicity of Islamic origins, and the diversity of Muslim contexts, I discuss the important topics to consider when constructing a biblical theology of Islam. In the light of authoritative biblical revelation, my approach also illuminates the connections between theology-in-context and our practice of disciple making. It is obviously a lot to discuss in just over 3,000 words (EMQ’s limit), but these are the major themes that need consideration in our contextual theology of Islam. I highly recommend reading this brief reflection of the recent massacre at Christchurch. For practical examples of biblically appropriate Christian engagement of Muslims, see Margins of Islam: Ministry in Diverse Muslim Contexts. As the Church, we need to improve how we think and talk about Islam. The April 2019 edition of Christianity Today features a cover story about DMM/CPM titled “Making Missions Count: How a Major Database Tracked Thailand’s Church-Planting Revival”: A movement in Southeast Asia shows how real-time reporting is building Great Commission connections. There are some interesting observations about the oft-debated use of metrics in ministry. It seems to me that the DMMs/CPMs I am aware of are constantly measuring and documenting the growth of the movement. Among other purposes, the use of metrics seems to serve as a kind of compass and a scoreboard that deeply motivates leaders and practitioners. Out of 13 mother churches, FJCCA has added more than 400 house churches since 2016. Its biggest challenge has been training new leaders, who are tasked with continuing the work of evangelizing and church-planting. FJCCA focuses on a simple gospel presentation, prayer, and intimate fellowship, a model that converts can adopt and take to the next unreached village. Rinnasak and fellow FJCCA leaders remove any “Christianese” from their phrasing, saying “Jesus bless you” rather than “God bless you” to specifically name the Christian God, and referring to believers’ “life experiences” rather than the more obtuse “testimony.” The association embraces the house church setting. When people convert in far-off villages with no Christian presence, it’s awkward and impractical for them to travel to existing congregations to learn and worship. Even once more mature churches move into buildings for Sunday worship, they still meet in homes as a more familiar location for discipleship. Evangelists travel to villages with enough people ready to stick around to start the discipleship process. They share Bible stories and personal accounts to point to Jesus. Once people put faith in Christ, they invite them to pray right away for what they need, returning within a day or two to offer further training and materials from the Thailand Bible League, another partner. Reach A Village noticed that the most effective church planters in the region share these distinctives. In Cambodia and Myanmar, the ministry also found that evangelism is “best carried out by local, indigenous believers and leaders who rely solely on the Scripture and the Holy Spirit with minimal outside interference or restrictions,” Craft said. FJCCA’s strategy is working, so much that Martin added a new staff member based in Phetchabun province dedicated to managing their figures. And he can barely keep up: Already, the movement has added 11,941 new believers in the past year and a half. I currently have two articles out at the moment in EMQ and IJFM. It is obviously a lot to discuss in just over 3,000 words (EMQ’s limit), but these are the major themes that need consideration in our theology of Islam. This is a longer article that deals with epistemology and issues which inevitably color our approaches to reaching Muslims. The Underground Network and Disciple Making Movements: Potentials for Integration? In this documentary, I look deeper into who the Underground Network is, and why their model for church could change the way the Western Church operates. There seems to be a lot of overlap from this model and disciple making movements (DMM). Two things stood out to me from the Underground Network: 1) their focus on affinity groups, 2) a decentralized, flat structure that values individual leadership initiative. Concerning 1, it seems they don’t target whole communities, but gather people together around affinities; like drinking beer, or anti-trafficking, or mentoring teenage girls. I think there is a lot of power in being able to focus on just a single issue and do it really well. This is not the homogenous unit principle but the congruence of cultural values. Concerning 2, being decentralized and having a difficult time articulating a common vision indicates they are more values based. There are strengths and weaknesses for both vision-based and values-based organizations. There are several other questions I have in mind though, the major one being fruitfulness and impact. Yes that is great that he started a Bible study with others who like beer, but is it more than just one study? I know of several friends who have done the same thing, but does it multiply and have deep impact in the community? I have similar questions for the other ministries who were spotlighted in the video (other than the Filipino pastor who said they started 100 house churches). The video brings up an important point, that you really can’t or shouldn’t try to change the culture/structure of the established, attractional/traditional church. Just work in partnership with them and do something alongside them among areas/peoples that they typically miss. We need each other. Throughout history, God has used two structures for his redemptive, missional purpose in the world. The first is called a "modality" and it refers to an inclusive group of people that nurtures its members and is structured. Examples are a local congregation or what we typically all a “church.” Modality structures handle local matters essential to the group. A second structure is called "sodality." Sodalities serve and extend modalities. Modalities are limited in their capacity because they serve local needs. But sodalities are flexible, exclusive structures that serve special functions. They are task oriented, like a mission agency or an NGO. The local church (modality) is essential for mission, but so is a mission agency or apostolic structure (sodality). Both serve in parallel to one another. Problems exist when one believes it doesn't need the other. I like the idea that our ecclesiology should include both modalities (local congregations) and sodalities (apostolic bands, NGOs, seminaries)- both structures are biblical and needed in God’s redemptive mission where the “church” is central to transformation. A final thought, is that I would love to see what it would look like for these ministries to have a more explicit integration with DMM principles, as outlined in Kingdom Unleashed. Sometimes the DMM literature speaks of things like “access ministry” as if it was only tangential to the essential mission of church planting. Instead, the Underground Network rightly conceptualizes this as more central to mission. But from what I can tell, the DBS concept is less prominent in the ministries in the Underground Network.? DBS could be more integrated in these groups to see Jesus-centered diffusion into their affinity groups. At the United Nations Human Rights Council in Geneva in March, a man sitting next to me was writing in Arabic the statement that he would be reading to the council. Adel was a Tunisian head of a nonprofit. I said hello in Arabic, and we introduced ourselves and exchanged cards. In the mind of Adel, the word “evangelical” on my business card, far from portraying a community of Christ-followers and imitators, is connected to the injustice and suffering of Palestinians, to America’s support to Israel and to U.S. wars in the Middle East. For millions of Muslims like Adel, evangelical support for Israel and U.S. foreign policy in the Middle East are stumbling blocks for the gospel. The election of Donald Trump, anti-Muslim discourses and the Stormy Daniels episode seem to have reinforced the perception among Muslims that Islam is on a higher moral ground than the Western Christian faith. I say “reinforced” because in several Arab countries, “Christian” or “Nazarene” has always been a derogatory word. I’m grateful to have had the opportunity to share with the participants an Arab evangelical perspective. The starting point for my message to the evangelical leaders in the room, however, was not my conversation with Adel. Between 2013 and 2017, while leading the Development and Partner Relations department at the Arab Baptist Theological Seminary (ABTS) in Beirut, Lebanon, I witnessed God’s amazing work in the Middle East and North Africa. The witness of local churches coupled with God’s miraculous pursuit of men and women swelled, in some cases exponentially, the ranks of Lebanese evangelical churches. My second point to the room was that many Middle Eastern ministries (refugee relief, peace-building, discipleship, medical missions and so on) and churches enjoy the great support and partnership of U.S. evangelical churches, particularly from congregations with majority Republican voters and supporters of President Trump. And then, I shared with them of my recent encounter with Adel and of the majority Muslim perception regarding U.S. evangelicals. Evangelical support (of many, but not by all) for U.S. Middle East policy and the actions of Israel against Palestinians are stumbling blocks to many – if not all – Muslims. We may never know if the number is in the millions or hundreds of millions. We only have anecdotal evidence. Last month, a friend recounted how he brought a group of Muslim leaders to a recent National Prayer Breakfast in Washington, D.C.
At the breakfast, these leaders heard a clear and articulate gospel message from a particular congressman, leaving them thirsty for more. However, their thirst didn’t last long. A few days later, the same congressman voted in favor of a congressional resolution supporting Israel. In their eyes, the gospel bore no fruit in the life of that congressman. I would also argue that evangelical support (of many, but not of all) for U.S. Middle East policy and the actions of Israel against Palestinians are stumbling blocks here at the United Nations for staff, diplomatic missions and human rights organizations, who perceive evangelicals as being supportive of injustice and the violation of international law. 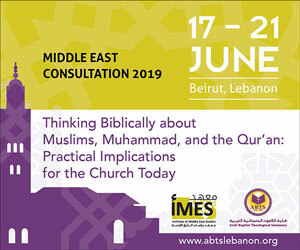 What, then, could my evangelical brothers and sisters in the U.S. do who hope to be witnesses to the love of Christ among Middle Eastern and Muslim peoples? These are some recommendations. 1. Encourage evangelical churches to “adopt” an unreached Muslim people group in a given city in the Middle East by partnering with a local ministry (indigenous when available) and include this ministry in their missions support and prayer. 2. Urge evangelicals visiting the Holy Land to fellowship with Palestinian Christians, engage with Palestinian Muslims as witnesses for Christ and spend the last three days of their trip in a hotel within the Palestinian territories. Currently, Holy Land visits circumvent Palestinians and thus fail to convey an accurate understanding of the situation. Holy Land pilgrimages are not benefiting the ailing Palestinian economy. Given Bethlehem’s historical importance as a Christian pilgrimage site, this is rather ironic in our current historical moment. 3. Speak up against political and community leaders promoting anti-Arab or anti-Muslim bigotry, much as we should continue speaking out as Christ-followers against anti-Semitism, racism, bigotry, sexism or any other form of prejudice. Are we, as evangelicals, ready to reject and rebuke a simplistic and extreme view of Islam that ignores Jesus’ command to love them as our neighbors, a view that is often promoted (in Lebanon and Europe as well as the U.S.) simply to garner votes? A recent survey in the United States showed a strong correlation between “Islamophobic” attitudes, “Christian nationalism” and support for certain candidates, parties or policies. “Overall the strongest predictors of Trump voting were the usual suspects of political identity and race followed closely by Islamophobia and Christian nationalism,” one recent article said. 4. Be cautious of dehumanizing rhetoric in media and political discourses surrounding persons of the Middle East. This takes place not only in secular media but also in “Christian” media outlets where the facts and sociohistorical context are routinely ignored. For example, recent headlines from the Christian Broadcasting Network declare things such as “Hamas Sacrificing Children,” “Why Gaza Clashes Aren’t Peaceful Protests but a Hamas-Inspired Death Cycle” and “Hamas Using Palestinian Masses as Newest Weapon Against Israel,” where Palestinians are portrayed as mindless masses, zombies even, with no mention of the Israeli embargo driving Palestinians in Gaza to despair and hopelessness and leading them to demonstrate. I also invite you to read the Institute of Middle East Studies regional brief on Israel-Palestine for April 2018 and May 2018. 5. Speak up against the “End Times Prophecy” industry. Media platforms and churches often use End Times Prophecy to shape Christian public opinion regarding Middle East policy, especially in relation to Israel, further demonizing Muslims and Middle Easterners and promoting oftentimes profound misunderstandings of the dynamics shaping the Middle East today. I invite you to read my post for IMES on this issue from May 2017. As of March 30, harrowing photos and videos emerged of Israeli snipers shooting unarmed Palestinian demonstrators. In one video, we hear the soldiers rejoicing at the death of a Palestinian. Israeli snipers shot and killed or maimed women, children, reporters, doctors and medical rescue teams and even wheelchair-bound demonstrators. The March of Return demonstrators have been falsely accused of violence and even of wanting to sacrifice their children for the sake of a public relations coup. If we want to pray and show compassion, if we want to honor the commandment to love our neighbor, should we not attempt to see things how the peoples of the Middle East, particularly the Palestinians in the current situation, see them? Shouldn’t our churches have better engagement of the region and of Muslim communities nearby and far away? Shouldn’t we speak out against those things that profoundly go against our values but are nevertheless attributed to us – lest we be like the man who sought to be justified when he asked Jesus, “Who is my neighbor?” (Luke 10:29). Wissam al-Saliby currently serves as advocacy officer of the World Evangelical Alliance based in Geneva, Switzerland. He formerly served as ABTS development and partner relations manager. A version of this article first appeared on the IMES blog. It is used with permission. You can follow him on Twitter @walsaliby. What do you do when “Islam” does not adequately describe the Muslims you know? Margins of Islam brings together a stellar collection of experienced missionary scholar-practitioners who explain their own approaches to a diversity of Muslims across the world. Each chapter grapples with a context that is significantly different from the way Islam is traditionally presented in mission texts. These crucial differences may be theological, socio-political, ethnic, or a specific variation of Islam in a context—but they all shape the way we do mission. This book will help you discover Islam as a lived experience in various settings and equip you to engage Muslims in any context, including your own. 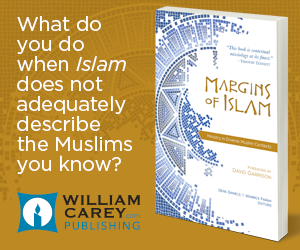 In a marvelous tour de force, Margins of Islam exposes the widely held, but false assumption that the house of Islam is a monolithic religious entity which either resists or responds to missiological strategies. Collectively, these authors offer up case studies and rich and textured “on the field” experience which reflects the true variegated diversity of Islam. This book is contextual missiology at its finest. The project was the brainchild of Gene Daniels. I vividly remember sitting next to him on a bus discussing it with him on our way to a conference center from a hotel a couple years ago. His big idea was to gather missionary scholar-practitioners serving in various Muslim settings to explain how they take context seriously and how they deal with the phenomenon that we call “Islam.” I was genuinely surprised and honored when he asked me to be his coeditor! We immediately started networking and looking for contributors. Gene already had several people in mind. My job was to help edit each chapter and then to produce a concluding chapter that explained the themes of the book. It was a rich learning experience. As I researched for the book, I found myself often disagreeing and pushing back on evangelical treatments of Islam. My criticism began to take shape and eventually became an introductory chapter—most evangelical missiological treatments of Islam are reductionistic with what I call a “top-down” approach, meaning that Islam (and subsequently, Muslims) can be adequately understood by addressing the Qur’an, hadith, and history of Islam. From this textual understanding, it is assumed that Muslims believe what Islam teaches, and thus there is a “Muslim worldview” and strategies on how to engage it. In this framework, Muslims are often simplified as cultural and spiritual clones of one another. Many workers have read books based on this top-down approach, but when they begin to engage Muslims in their context, they quickly discover that the Muslims they are working with believe very different things from what “Islam” teaches. While the top-down approach is incredibly valuable, it can also distort our understanding of Muslims if it is our only lens. We also need a “bottom-up” approach that explains the historical evolution of the Islamic phenomenon and the sociological perspectives that accounts for the diversity of Islam today. Ergo my chapter two: How Muslims Shape and Use Islam: Towards a Missiological Understanding. Margins of Islam takes readers on a global journey revealing the multiple expressions of the Islamic faith… We no longer have any excuse to train others to reach all Muslims in the same way. I want to thank Gene for this incredible opportunity, and also for our excellent group of contributors who have taught me so much about the variety of Muslims and the varieties of biblical mission in the world today. Go ahead and buy the book on Amazon, and please help us spread the word—you can easily share this from the button on the bottom of the post on the blog. Thank you for considering! We feel this volume represents a significant encouragement for the mission of the church. When I first read Jenny Taylor’s brief article Why Grace is Not Enough to Reach Muslims: Balancing Grace and Truth in Outreach, I admit I was surprised that Lausanne would allow an article like this associated with it’s name. It was a bit confusing, and it seemed to imply that anyone who does not truly understand that violence is core to Islam has somehow minimized “truth” in their ministry approach to Muslims. I encourage you to read these two brief articles. This is an important conversation. I'm not sure I like the video I'm posting below. It is sensationalistic, mistakes Christendom for biblical faith, and seems to imply that secularism is better than Islam. But it makes a very interesting point about the future influence of Islam. I have heard about it from a couple different sources now. I did not check the stats but I assume they are correct. Ummm, yeah. I should have checked the stats. I’m so sorry 16 million people have seen this misleading video. Today, I saw that the BBC has finally fact-checked the video. The blog: Understanding Islam: Toward a Balanced Perspective has posted a nice write-up about it. Here is the link: Is Islam taking over the world? I apologize for posting the original video 9 years ago. As Christians, we need to recognize fear-mongering when we see it, especially from fellow evangelicals. At the least, it makes an interesting case study in how some quarters of the missions movement try to manipulate us. Islamophobia is real. Based on a Qur’anic keyword meaning the “straight path,” the sharia was first elaborated by Muslim scholars as a philosophical and theological rather than a strictly legal concept (W.C. Smith 1962). Yet over time and by virtue of the force represented by the rising importance of Sufism as a discipline stressing the inner truth, the sharia, as much as it was seen as the manifestation of divine Will (shar`), also came to represent the outer dimensions of the ethico-religious code of Islam. The sharia happened to be identified with the more systematic dimension of the Islamic normativity, the one that could be formulated in terms of legal norms which, in turn, would be liable – to a not yet exclusive extent – to be enforced. Apart from this technically legal dimension, the sharia covered a comprehensive concept of norm, which included ritual and dietary rules, as well as rules about family, commerce, and social relations more in general. However, this normative idiom, reflecting basic values of humanity, justice, and equality, never became a code in the sense of a closed (and univocally ‘searchable’) text. It rather preserved an inherent, inner pluralism and contestability in the form of a cumulative tradition articulated in translocal schools and local, contextualized sets of practices variably drawing from most pre-Islamic customs. This is why the understandings of sharia and related practices have been historically dependent on the types of knowledge and the varieties of culture prevalent on a local scale, as well as on the degree of social contention and reconstruction that they authorized. The convergence between concretely practiced Islamic jurisprudence and the idea of sharia was therefore a diversified, gradual, and (at least till the colonial era) never fully accomplished process… Modern attempts to systematize and implement sharia, whether associated with ‘liberal’ and ‘reformist’ or with ‘fundamentalist’ and ‘puritan’ interpretations (all labels that, originating in Western history, should be taken with a grain of salt), have been hardly able to extinguish its historic dynamism. Yet they certainly contributed to obfuscate the consciousness of this dynamism among a mass public, which in the colonial and postcolonial eras has been more prone to appreciate its new rigidified contours. It is a myth to assume that sharia is a universal, coherent legal code that is ready to be applied. Any missiological approach to Muslims that claims sharia is some sort of spiritual force that means the same thing to all Muslims everywhere has not done enough contextual analysis. Good article by Brandon Withrow: Is There a Christian Double Standard on Religious Violence? Nearly 80 percent of Christians don’t think a terrorist acting in the name of Christianity is Christian. But more than half say terrorists acting in the name of Islam are Muslims. The article does a good job exploring different perspectives on religion and violence using a mosaic of both Christian and Muslim voices. This is a debate with layers of complexity that will probably never end. Interesting interview of an atheist Muslim who attempts to retain a Muslim identity while rejecting Islamic ideology. He nuances between extremes on how to define something as Islamic/Muslim. Also helpful is how he describes the errors of the left which conflate legitimate criticism of Islam with Islamophobia and the errors of the right which demonize Muslims. This kind of book nicely illustrates the incredible diversity in the so-called ‘Muslim world’ today. Here is an excellent video from Richard Yacoub that explains the implications of patronage for ministry with Syrian refugees. Applications extend to many other contexts as well. Hanaan grew up very disillusioned with the hypocritical lifestyles of some fundamentalist Muslims she knew. One night a man in a brilliant white robe holding a staff appeared in her dream and told her that she was correct to doubt Islam. The next morning she described this event to her loving and devout Muslim father, who told her the person from her dream was Isa al Masih. Eagerly she went to the Qur’an and read everything she could about Jesus, who continued to show up in dreams for many years at key moments in her life. According to her testimony, Hanaan joined herself to Jesus long before she met another Christ follower who studied the Bible with her for the first time. Like Hanaan, MBBs appear to bond themselves to Christ in a patron-client relationship as they initially begin to understand His lordship and even the atonement. A biblical, missiological view of conversion must take into account the social context of the first century Mediterranean world (Asia and Africa are much closer to this worldview today than is the West). Relationships were conceptualized around the concept of “patronage,” where “they saw their gods as patrons and benefactors and their own conduct as clients” (Crook 2004, 254). “In this hierarchical society, where the status of the person you follow and to whom you give allegiance is very important, the position of Isa becomes the focus of reconsideration” (Edwards 2013, 84). MBBs relate to Christ in ways that are difficult for Westerners to understand, but make sense in their worldview. Yet this understanding of salvation is commonly found in the writings of the Apostle Paul. Christ is our ultimate Patron (the Divine Lord), we must be found “in him” and part of the new people of God. Just think of all the important conversations this video can generate: the nature of religion, the origins of Christmas, appropriation, Islamophobia, contextualization, objectivity, religious plurality, interreligious encounter, etc., etc. If you have any thoughts about this video, please comment below. 6: Conclusion- Is God Doing Something New? The ‘world religions’ approach has a tendency to view people of faith as prisoners of theological systems, whose every move can be predicted by their communities’ sacred scriptures. Whereas the ‘sociology of religions’ approach offers a dynamic vision of mutually-influential forces between theology and the practice of religion. I would argue that the latter vision offers us a far richer field of inquiry, engagement, and action than the former. From a missional perspective, therefore, it is far more useful, far more empowering and energizing; it invites us to new possibilities in terms of creative and constructive action required for the mission of God. A couple notes on George Yip, in his article The Contour of a Post-Postmodern Missiology. In the Bridging the Divide network, through numerous case studies from scholar-practitioners with a wide range of perspectives and experiences, we have learned of the incredible diversity of contexts within “the Muslim world.” We have noted not only differences of social and political contexts, but also of diverse spiritual alignments and experiences among Muslims. Within these very different contexts, God is working in a variety of creative ways to shine the light of the gospel. See also: The Essentialist Fallacy. Christianity is not only a global but also an intercultural phenomenon. The diversity of world Christianity is evident not merely outside our borders but even within our own neighborhoods. Over the past half century theologians and missiologists have addressed this reality by developing local and contextual theologies and by exploring issues like contextualization, inculturation, and translation. In recent years these various trajectories have coalesced into a new field called intercultural theology. Bringing together missiology, religious studies, social science research, and Christian theology, the field of intercultural theology is a fresh attempt to rethink the discipline of theology in light of the diversity and pluriformity of Christianity today. Henning Wrogemann, one of the leading missiologists and scholars of religion in Europe, has written the most comprehensive textbook on the subject of Christianity and culture today. In three volumes his Intercultural Theology provides an exhaustive account of the history, theory, and practice of Christian mission. Volume one introduces the concepts of culture and context, volume two surveys theologies of mission both past and present, and volume three explores theologies of religion and interreligious relationships. In this first volume on intercultural hermeneutics, Wrogemann introduces the term "intercultural theology" and investigates what it means to understand another cultural context. In addition to surveying different hermeneutical theories and concepts of culture, he assesses how intercultural understanding has taken place throughout the history of Christian mission. Wrogemann also provides an extensive discussion of contextual theologies with a special focus on African theologies. Intercultural Theology is an indispensable resource for all people―especially students, pastors, and scholars―that explores the defining issues of Christian identity and practice in the context of an increasingly intercultural and interreligious world. The most common reason missionaries go home is not due to lack of money, illness, terrorism, homesickness, or even a lack of fruit or response to the gospel. Regretfully, the number one reason is due to conflict with other missionaries. From my own personal experience on the field and after five years training, equipping, and sending missionaries, I have witnessed this truth firsthand. In all my travels around the world, I’ve spent countless days with missionary teams of all types, sizes, and makeups and one reality remains true: none of them are perfect. In fact, toward the end of the 20th century the World Evangelical Alliance released a significant study that found “conflict with peers” as the top reason North American missionaries leave the mission field. In light of the seemingly inevitable conflict with other missionaries, many may wonder why we emphasize teams. The simple answer is that this is the example and model we see in the Bible. Team is the predominant model we see for mission work in the New Testament. Jesus and his disciples lived together and did ministry together. Paul and Barnabas—set apart by the Holy Spirit and the church in Antioch—went out together on the first missionary journey. We see further evidence of teams on mission in Paul’s “apostolic band.” One scholar notes that in the New Testament, at least 55 men and 17 women were associated with Paul on his missionary journeys. All this to say, there are biblical, practical, and pastoral reasons why we encourage the formation and sending of missionary teams. Conflict within missionary teams is inevitable in a fallen world. Here are five challenges that threaten all missionaries and missionary teams. Whether we realize it or not, we all arrive on the mission field with certain expectations. These expectations are shaped and formed by our previous experiences. Unmet expectations related to missionary teams are a real problem, especially for young missionaries with an idealistic perspective of the mission field. Sinful people + work with other sinful people + those people trying to witness to and reach other sinful people = lots of sinful people and potential for conflict. When you join a team on the mission field, you are stepping into this conflict equation and you must acknowledge that reality. 3. Missionary life is stressful. Missionary life is filled with stress and pressure, and much of it is subconscious. Things that seemed so simple—like driving, grocery shopping, paying bills, or sleeping—suddenly become very challenging and stressful. It’s not always easy to articulate and identify, but subconscious stress is a reality for many missionaries and missionary teams around the world. We’re creatures who naturally like to compare ourselves with others. Teams often live life together and are around each other often, so there is a great tendency for envy to creep in. If we aren’t careful, we can compare, become jealous, and in the process destroy a team with our own pride. 5. Sin remains a constant reality. The bottom line is that we’re sinful people. We’re selfish, we’re prideful, and when put in stressful situations, we’re often poor teammates and partners in the Great Commission. So, in light of these challenges, what are missionaries and missionary teams supposed to do? 1. Missionaries need to have a realistic perspective of team. Missionary teams are not perfect and are made up of sinful people. Therefore, beware of going to the mission field with an idealistic and utopian perspective of team. 2. Missionaries must strive to be flexible and adaptable. Nobody likes teaming with high maintenance people. Most missionaries are entering a culture where they have little control over most things that happen and, as a result, flexibility and adaptability are critical. 3. Missionaries ought to prepare spiritually, physically, and emotionally before going to the field. As Mack Stiles once wrote, “There is no such thing as transformation by aviation.” Missionaries must intentionally pursue intimacy with Christ and learn to abide in him long before they ever cross geographical, cultural, and linguistic barriers. In the end, being a good teammate is not just a matter of effort, though that’s important; it’s a matter of grace and mercy. We need God’s grace and mercy on a moment-by-moment basis. We need the gospel to change us from the inside out. We need the Holy Spirit to change our hearts, wills, desires, and affection—and in the process make us more like Jesus. That is the only way we can be the kind of teammates who honor God and help fuel the spread of the gospel to the ends of the earth. This chapter is the meatiest of Insider Jesus: Theological Reflections on New Christian Movements, and if you only read one chapter, it should be this one. Dyrness summarizes most of his main points thus far, and builds upon an interesting discussion of religion in regards to mission today. Because of the Reformation and Enlightenment where religion became an abstract, cognitive enterprise, Westerns are naturally incapable of understanding other ways that religion can function in peoples lives. In this understanding, the gospel must be framed in the cultural logic and aesthetic patterns that make that place feel like a home. Religion becomes a necessary place for people to work out for themselves what it means to follow Christ. …represents an appropriation by a particular stream of the Christian tradition of early modern (and later Enlightenment and Romantic) sensitivities. This tradition represents, I would argue, an important interpretation of the work of Christ that allows it to be heard in a modern Western setting; it is a critical hermeneutical space. But in terms of the broader Christian tradition, even in terms of biblical teaching, it is not necessarily privileged— even if, for its practitioners, it is a more transparent and satisfying expression of the gospel than any other. It does not represent the full meaning of religion, nor does it exhaust the possibilities inherent in the gospel. 33 Moreover, sensitive listening to Muslim believers discloses practices that, though different from those typical to Christians, issues in experiences that we might characterize as life giving, even if they are not salvific. But if this is so, we might venture to reframe the question raised earlier: might it be possible for other practices, developed in vastly different settings, to be carriers of genuine faith in Christ? There is indeed a continuity and discontinuity between the gospel and all other religious contexts, including Christian ones. God is at work in all contexts, and yet the gospel is not found naturally in any one culture. Therefore there must be a discontinuity between the gospel and religion. Yet Christ did not come to do away with religion but to transform it from within. So what do we do with syncretism? So how do we think of mission? Then what is the church? That is the subject of the final chapter. I found the discussion on syncretism wanting. Of course there will always be mixing, but what are the safeguards? Dyrness would probably say that I am too quick to ask the question. Next, Chapter 6: Conclusion: Is God Doing Something New? Previously we looked at Insider Jesus 3: Religion in the Biblical Narrative, now we look at case studies. Dyrness starts by showing some historical examples of the creation myths in tribal peoples to show how similar their stories are with the Jesus “myth” (i.e. a local deity who had to sacrifice himself to give life to people). According to Dyrness, it is missiologically unwise to just simply neglect these stories and replace it with the Christian story- in so doing we miss the important ways in which God was already at work in that culture and could rob that culture of unique contributions to the understanding of the gospel and the formation of their cultural identity in Christ. Dyrness then provides three current examples of insider movements today among 1) Hindus and Sikhs in India, 2) Buddhists in Thailand, and 3) Muslims in the Philippines. Each case study seeks to show how religious practices provide the hermeneutical space necessary for these peoples to attempt to understand what it means to know God in Christ, and necessary to see the truth of Christ understood in the logic of that culture. Each of these case studies are at the “Reinterpreting Insider” on my Five Expressions of Insiderness model. The “Dual-belonging Insider” is a different expression and is less involved the ritual and theological dimensions of religion. I wholeheartedly agree that much of what people reject is Western Christianity, and not necessarily biblical faith. Most of these case studies beg for more info. I REALLY REALLY want to know more about their Christology and ecclesiology, including their understanding of idolatry, among other things. Thus, it makes it difficult to evaluate. Next is Chapter 5, Religion and the Mission of Christ for what these movements mean for our conception of mission today. Muslim Identities: An Introduction to Islam, by Aaron W. Hughes. Hughes approaches Islam from the religious studies perspective (not necessarily from Islamics) and tries to steer a middle way between a theological introduction and a polemic against Islam. He shows the diversity of islams today and draws many important contrasts between traditional Islamic teachings (often exposing historical inaccuracies in Islam’s account of its origins) and how Muslims in different places diverge from those understandings. For Hughes, a ‘Muslim’ identity is something more created than it is inherited. I appreciate his ability to portray the complexity of Islam in a way that is not complicated, rather than simply homogenize Islam, which has been so common in books on Islam since 9/11. I also like The Emergence of Islam: Classical Tradition in Contemporary Perspective by Gabriel Said Reynolds, and A New Introduction to Islam by Daniel Brown. What is your favorite Intro to Islam, and why?